When Donald Trump picked Paul Manafort to be his campaign chair last March, the political operative was a relatively minor player in Washington, consigned to working for deep-pocketed foreign benefactors. That those benefactors have turned out to include Russian oligarchs and Ukrainian politicians with ties to Vladimir Putin is sure to cause growing concern in the Trump White House. Now it appears increasingly likely that Mr Manafort is one of the "individuals associated with the Trump campaign", in Director James Comey's words, at the heart of an ongoing FBI investigation. This would explain why White House Press Secretary Sean Spicer recently downplayed Mr Manafort's connections to the Trump team, saying he "played a very limited role" in the campaign for "a very limited amount of time". Mr Manafort could face legal consequences if the FBI concludes that he did not properly disclose his work for foreign leaders. That would at the very least prove embarrassing for Mr Trump, given the power he delegated to Mr Manafort last summer. If it turns out that Mr Manafort's contacts with foreign interests continued during his time at the top of the Trump campaign, the situation for the White House could go from embarrassing to full-blown scandal. In a statement to AP, Mr Manafort confirmed that he had worked for Mr Deripaska in several countries but insisted the work was being unfairly cast as "inappropriate or nefarious" as part of a "smear campaign". "I worked with Oleg Deripaska almost a decade ago representing him on business and personal matters in countries where he had investments," Mr Manafort said in the statement. A spokesman for Mr Deripaska in Moscow declined to answer questions from AP. Further allegations have been made in Ukraine about secret funds said to have been paid to Mr Manafort. 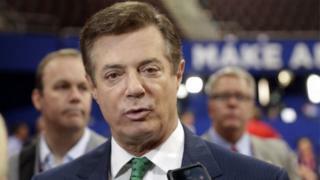 Lawmaker Serhiy Leshchenko said he had evidence that Mr Manafort had tried to hide a payment of $750,000 (£600,800) by a pro-Russian party in 2009. Mr Manafort's spokesman said the claim was "baseless". Mr Manafort was an adviser to Ukraine's ex-President Viktor Yanukovych, but denies receiving any cash payments.